National Army Museum -- front of building. The Air Force, Marines and Navy all have large-scale national museums. But the U.S. Army does not. Doesn't seem quite right, does it? Well, that will change in 2013, when the National Army Museum is scheduled to open at Fort Belvoir in Virginia. 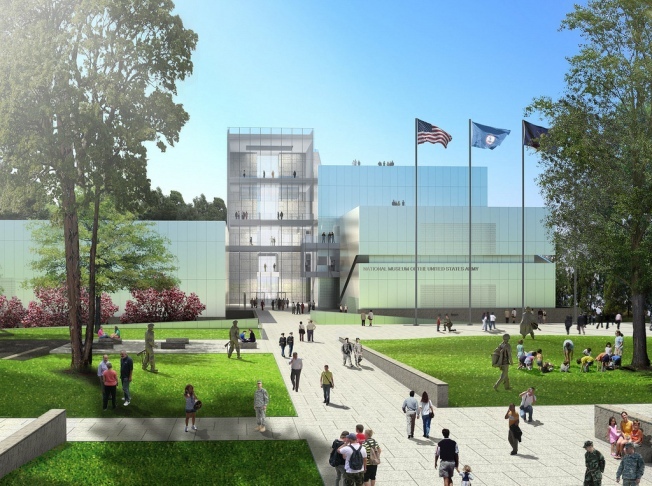 The Army Historical Foundation recently released renderings of what that national museum will look like. While the design is still in flux, right now it includes an observation tower at the main entrance and what looks like a Vietnam Memorial-inspired entranceway. While the look of the museum campus is still being finalized, the artifacts contained inside are starting to be collected, including a World War I-era M1917 light tank and a WWI Liberty Truck. Haven't checked out any of the other Armed Forces museums? It might be time. The U.S. Navy Museum is at Washington Navy Yard in Southeast. The National Museum of the Marine Corps is located in Triangle, Va. And the National Museum of the U.S. Air Force is located at Wright-Patterson Air Force Base in Ohio.